UMLS Metathesaurus has been selected as the basis for the track reference alignments. UMLS is currently the most comprehensive effort for integrating independently-developed medical thesauri and ontologies, including FMA, SNOMED CT, and NCI. The integration of new UMLS sources combines automatic techniques, expert assessment, and auditing protocols. Ernesto Jimenez-Ruiz, Bernardo Cuenca Grau and Ian Horrocks. Is my ontology matching system similar to yours?. The 8th International Workshop on Ontology Matching. [pdf]. October 2013. Ernesto Jimenez-Ruiz, Christian Meilicke, Bernardo Cuenca Grau and Ian Horrocks. Evaluating Mapping Repair Systems with Large Biomedical Ontologies. In 26th International Workshop on Description Logics. In Volume 1014 of CEUR-WS.org. July 2013. Catia Pesquita, Daniel Faria, Emanuel Santos, Francisco M. Couto. To repair or not to repair: reconciling correctness and coherence in ontology reference alignments. In OM 2013 workshop. [pdf]. October 2013. Results of the Ontology Alignment Evaluation Initiative 2018. In: Ontology Matching Workshop (2018). Volume 2288 of CEUR-WS.org. October 2018. Results of the Ontology Alignment Evaluation Initiative 2017. In: Ontology Matching Workshop (2017). Volume 2032 of CEUR-WS.org. October 2017. Results of the Ontology Alignment Evaluation Initiative 2016. In: Ontology Matching Workshop (2016). Volume 1766 of CEUR-WS.org. October 2016. 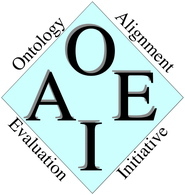 Results of the Ontology Alignment Evaluation Initiative 2015. In: Ontology Matching Workshop (2015). Volume 1545 of CEUR-WS.org. October 2015. Results of the Ontology Alignment Evaluation Initiative 2014. In: Ontology Matching Workshop (2014). Volume 1317 of CEUR-WS.org. October 2014. Results of the Ontology Alignment Evaluation Initiative 2013. In: Ontology Matching Workshop (2013). Volume 1111 of CEUR-WS.org. October 2013. Results of the Ontology Alignment Evaluation Initiative 2012. In: Ontology Matching Workshop (2012). Volume 946 of CEUR-WS.org. October 2012. We would like to thank the participants and organisers of the OAEI campaigns, especially Christian Meilicke, for their help in the setting up of this track. We also thank Bernardo Cuenca Grau and Ian Horrocks for their unvaluable help in past editions of this OAEI track. The track is currently supported by the SIRIUS Centre for Research-driven Innovation and the AIDA project. The track was also supported in the past by the SEALS, LogMap and Optique projects.